Cairoli and Covington Claim Czech Qualifying. 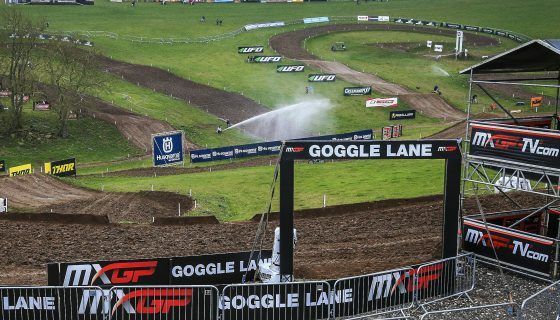 The FIM Motocross World Championship has raced the first time around the hillsides of Loket today for Qualifying day at the 2018 MXGP of Czech Republic. Returning to pole position were Red Bull KTM Factory Racing’s Antonio Cairoli and Rockstar Energy Husqvarna Factory Racing’s Thomas Covington. If Saturday’s Qualifying races were any indication of Sunday’s action the outcome will be unpredictable. 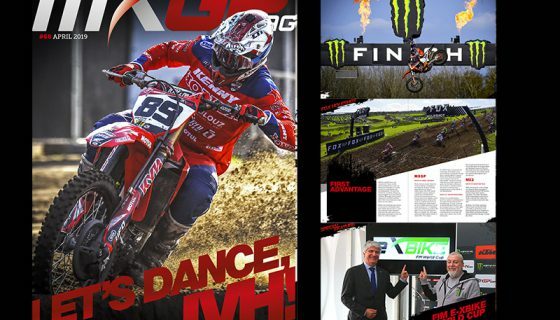 While the MXGP class was as competitive as always the MX2 racing was completely unexpected. Aside from the stars of MXGP and MX2 Czech motocross fans were treated to the 2 stroke races of EMX300 presented by FMF Racing, EMX85, and EMX65. The stacked and full EMX gates saw Dennis Ulrich (EMX300), Camden Mc Lellan (EMX85), and Damian Knuiman (EMX65) each win hard fought first races of the two this weekend. 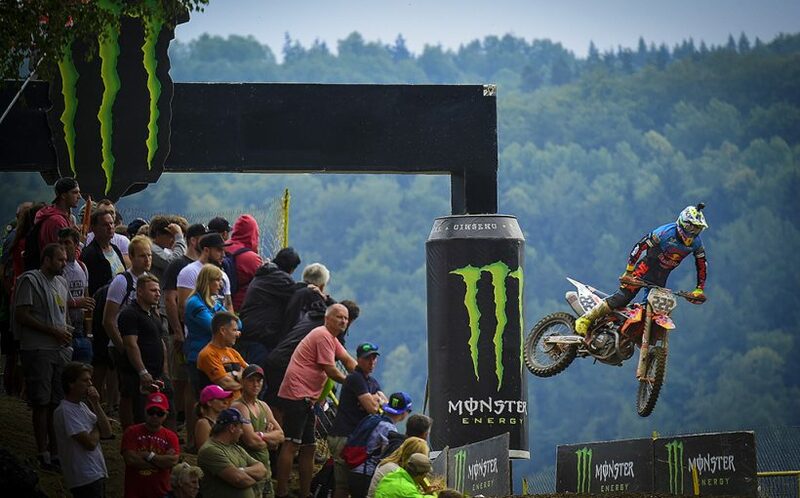 MXGP Qualifying was led by Red Bull KTM Factory Racing’s Antonio Cairoli into the first turn but it was Rockstar Energy Husqvarna Factory Racing’s Max Anstie that wowed the crowd by taking the premier spot on the opening lap. Anstie, who has had a difficult season so far, led Cairoli for 7 laps while Team HRC’s Tim Gajser gave chase in third. Red Bull KTM Factory Racing’s Jeffrey Herlings was 4th off the start and rode comfortably in the position for the majority of the race. Also in the lead group was Monster Energy Kawasaki Racing Team’s Clement Desalle with BIKE IT DRT Kawasaki’s Tommy Searle slightly further back. Searle however was passed by Monster Energy Yamaha Factory MXGP’s Jeremy Van Horebeek on lap 2. Van Horebeek showed the speed normally expected of him after a series of challenging races which will make him one to watch Sunday along with the fact his only GP victory came at this track in 2014. Van Horebeek’s Monster Energy Yamaha Factory MXGP teammate Romain Febvre worked his way through the pack after running in 14th, just behind the returning BOS GP rider Jordi Tixier, on the first lap. Febvre was able to climb his way up to 9th by lap 7. On lap 8 Cairoli took the lead from Anstie and immediately created a gap which seemingly encouraged Herlings to put in a fast lap and take a spot from Anstie along with Gajser on lap 10. Gajser fought to hold off the “Bullet” but Herlings found his way up the inside of the Slovenian on the far side of the track during lap 12. With 2 laps remaining Cairoli’s lead was too much for Herlings and at the finish it was Cairoli taking the win, Herlings second then Gajser, Anstie, Desalle and Van Horebeek. 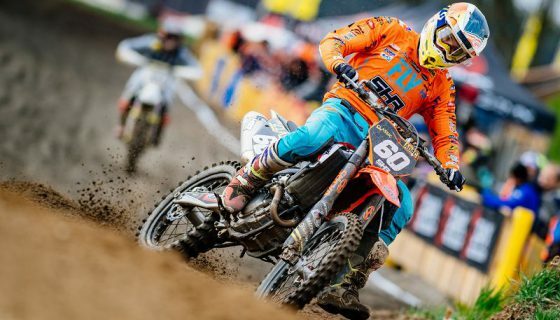 The Qualifying win was only the 3rd for Cairoli this season. 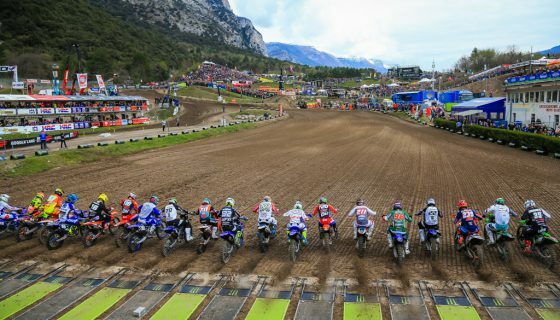 The MX2 Qualifying race was full of surprises from the start with Kemea Yamaha Official MX2 Team’s Jago Geerts leading Rockstar Energy Husqvarna Factory Racing’s Thomas Covington while Red Bull KTM Factory Racing’s Jorge Prado and Pauls Jonass had issues. Covington took the lead from Geerts on the opening lap and started to pull away quickly but the real question was where the MX2 points leaders of Jonass and Prado were. The answer was Prado in 17th and Jonass 18th. Jonass made quick work up to 12th by lap 4 while Prado only gained one position. In the fight for the top however was KTM Silver Action’s Stephen Rubini in 3rd chased by Honda 114 Motorsport’s Bas Vaessen, STC Racing Husqvarna’s Henry Jacobi, and F&H Racing Team’s Adam Sterry. Also in a battle for position was JD Gunnex KTM Racing’s Richard Sikyna in 7th and BIKE IT DRT Kawasaki’s fill-in from Brazil, Gustavo Pessoa, in 10th. Between the two of Sikyna and Pessoa was Rockstar Energy Husqvarna’s Thomas Kjer Olsen and Jumbo No Fear Vamo Honda’s Marshal Weltin. Olsen made his way forward from 9th and so too did Kemea Yamaha Official MX2 Team’s Ben Watson from 12th. 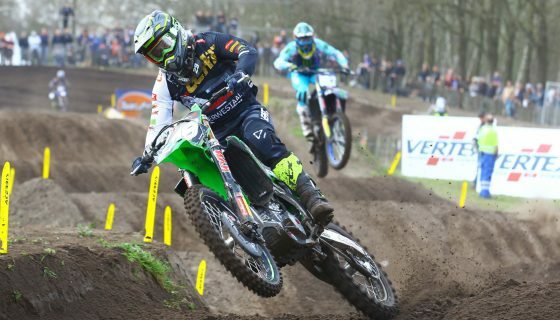 Going backwards in the standings was Vaessen who fell from 4th to 13th. For Jonass the race didn’t get any easier when he came together with Team HRC’s Calvin Vlaanderen while battling over 11th. Both riders remounted but Jonass was in 24th and Vlaanderen got up in 31st. Back at the front Covington was long gone but Rubini was under pressure from the relentless speed of Olsen and Watson. Olsen made the pass to take third and Watson was next for fourth before Sterry took 5th. At the finish Covington took the win followed by Geerts, Olsen, Watson and Sterry. Prado took 10th just behind the returning Honda 114 Motorsports rider Hunter Lawrence while Jonass finished 16th and Vlaanderen 21st. MX2 Qualifying Race Top Ten: 1. 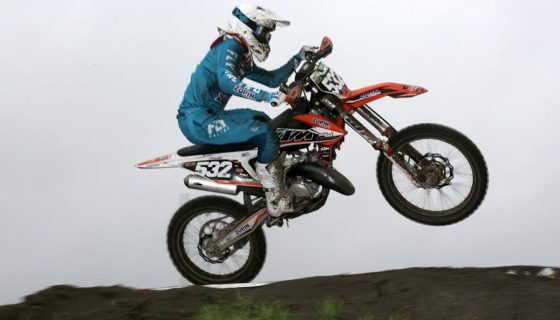 Thomas Covington (USA, Husqvarna), 24:27.968; 2. Jago Geerts (BEL, Yamaha), +0:11.714; 3. Thomas Kjer Olsen (DEN, Husqvarna), +0:15.934; 4. Ben Watson (GBR, Yamaha), +0:16.865; 5. Adam Sterry (GBR, Kawasaki), +0:23.106; 6. Stephen Rubini (FRA, KTM), +0:25.817; 7. Henry Jacobi (GER, Husqvarna), +0:29.317; 8. Marshal Weltin (USA, Honda), +0:42.379; 9. Hunter Lawrence (AUS, Honda), +0:45.901; 10. Jorge Prado (ESP, KTM), +0:49.602.